An average cruise ship travelling between BC and Alaska carries at least 3,000 passengers and crew, making each ship a virtual floating town — complete with all the waste, sewage, and pollution that any town produces. 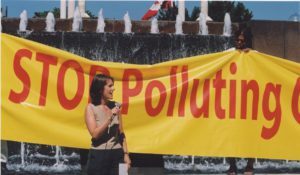 Each year, between 200 and 300 cruise ships, carrying over a million people, ply the waters of Georgia Strait and the Inside Passage with their emissions and discharges largely unmonitored. With cruise ships a seemingly permanent part of our landscape, its significant environmental impacts will continue to worsen unless stronger regulations are enacted. 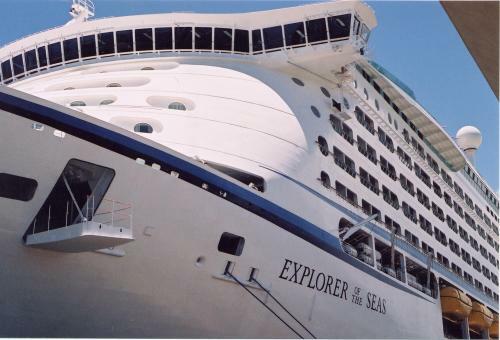 Royal Caribbean’s “Voyager of the Seas” carries 5,000 passengers and crew. Floating cities such as this are larger than most northern BC coastal communities. Yet, the economic benefit of these vessels is minimal and even harder to measure. 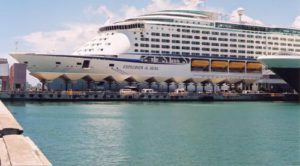 Cruise ship discharges are much worse than sewage discharges from other vessels as they generate up to 25,000 gallons of sewage from toilets and 143,000 gallons of sewage from sinks, galleys and showers each day. The type of chemicals discharged from these ships is of serious concern. As well as sewage, discharges can include oily waste water and toxic chemicals such as dry cleaning solutions. As well, air emissions from cruise ships are a major source of nitrous oxides, sulphur oxides and diesel particulate matter. The large oceangoing cruise ships that ply BC’s waters collectively produce hundreds of millions of gallons of wastewater during each cruise season. The good news is that an increasing number of ships have onboard wastewater treatment systems. The bad news is that while in Canadian waters, the laws remain weak around monitoring and enforcement to ensure sewage is not discharged while in BC waters. Developing fair and enforceable regulations for a high profile industry like cruise ships is challenging, especially when ships move from one jurisdiction to another. Regulations must protect the environment while not giving an economic advantage to ports outside BC. But just because it’s challenging does not mean it’s impossible. We need only look at the state of Alaska as an example. In 2001, Alaska enacted regulations to protect its coastal waters while still supporting a thriving cruise ship industry. The regulations create a program for sampling, testing and reporting wastewater and air discharges. There are enforceable standards for what cruise ships may discharge in Alaskan waters. The cruise ship industry covers the costs of these programs. One direct benefit to British Columbians of Alaska’s strong regulations has been that some cruise ship lines, including Royal Caribbean, have installed advanced wastewater treatment facilities on ships used on their Alaska routes (Alaska now insists that ships have advanced waste water systems onboard). Alaska provides a good model of how regulations can push industry to be more environmentally responsible. However, strong regulatory enforcement in one region is not enough, as it simply means the industry can take its problem somewhere else. With no monitoring in place once the ships travel into BC waters, any ship that doesn’t have this high level of treatment technology on board can legally dump its waste in our waters. With each cruise ship season bringing between 200 -300 of these huge ships to BC, the need for regulations in our own waters is greater than ever. In Canada we have no laws preventing cruise ships from dumping sewage—even untreated—almost anywhere in our waters. We have no government monitoring of discharges and no inspections of onboard treatment systems. We have guidelines with no enforcement, not a significant deterrent to stop pollution. Canada and BC have fallen far behind the US and Alaska in controlling cruise ship pollution. For example, a cruise ship that sails from Seattle to Alaska can’t legally dump sewage in Washington’s or Alaska’s waters. But it can legally dump raw sewage for most of the thousand kilometres it travels in BC. Even where rules do exist, there is little real enforcement. GSA also submitted our comments on proposed guidelines that just didn’t go far enough. Thought many years have passed, we are still waiting. 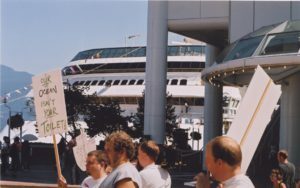 The strongest argument against regulating the cruise ship industry is that it would harm an industry that has huge economic benefits to BC. According to the industry, the sleek, white vessels that glide through our waters are a sign of economic growth and a sustainable industry that British Columbians should support. These ships bring thousands of people to our cities, where they spend money and help revitalize our struggling economy. However, past reports from both the Vancouver Island Public Research Group and the Canadian Centre for Policy Alternatives indicate otherwise. Both suggest that the economic benefits of this industry are not so great that we should welcome them into our ports without being fully aware of just who we are inviting in. 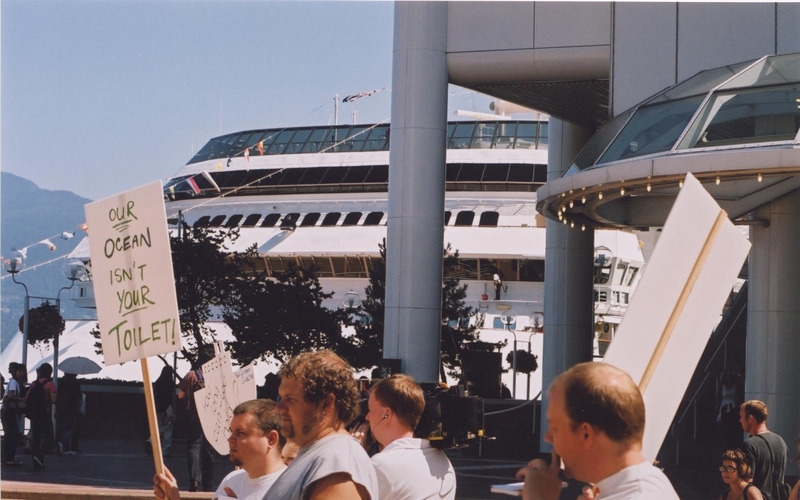 As of 2003, Vancouver had spent $130 million to upgrade its ports to accommodate cruise ships, with the rationale that tourists spend as much as $100 per person in our cities. However, a study in St John’s found that each passenger spent only about $55.71, and mostly on souvenirs. There is no evidence that this has changed substantially. Though there are economic benefits to port facilities, it seems that the brief stays in our harbours have questionable economic benefits. Cruise ships, as regulated and operated today, are not a sustainable industry. We need true accountability, to ensure that when these huge guests use our waters, they leave nothing more harmful behind than their wake.